As we venture deeper into the 21st century, the number of conflicts, especially in the era of politics, seems to increase along with their impact on our lives. Although turmoils have been constant considering human history, the omnipresent media coverage and our representatives emphasizing their significance through their technological mouthpieces highlights this impact for us. Interestingly, while language and communication plays a vital role in establishing them, the actual execution of these events does not need words at all. In fact, it needs very little action, maybe just a few decisive steps in a certain direction. Whether this observation was one of the motivations behind Indian director Abhiroop Basu’s short feature “Meal” may be left to the viewer, but the nature of conflicts is certainly at the core of the film. In an article about the film, the director describes the movie as founded on an “amalgamation of things”, for example the conflict between the political right and left. As a result, “Meal” explores how conflict shapes people and their relationships as it goes far beyond demonstrations and acts of violence. The minimal story of “Meal” takes place in a dirty apartment occupied by a family of four during a family meal. While the mother (Rathnabali Bhattacharjee) prepares the food, their son (Avishek Jain) readies himself to leave the family home and go to university. Meanwhile the father (Adil Hussain) seems to be searching for something, rummaging through various pieces of luggage. His father (Arun Mukherjee) watches the scene in silence. 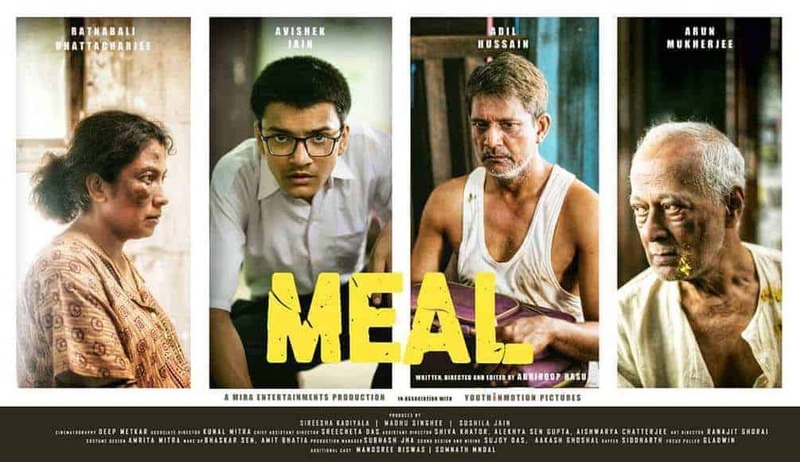 Obviously, “Meal” is not a film which offers a lot in terms of dialogue. In fact, the only spoken word comes from the radio broadcasting news about demonstrations and riots on the streets as well as a few faint sounds from the streets muffled by traffic. This reliance on the sounds of the apartment – the hissing of boiling water, the breathing of its occupants and their footsteps on the filthy floor – creates a feeling of deep discomfort as it seems to predict a violent eruption of some sort. In a way, you might even hesitate to speak of the family Basu portrays in his film. Considering their behaviour to each other, highlighted by an early scene between Mukherjee’s and Hussain’s character, they seem to struggle to recognize the other person as part of their family unit. Essentially, the idea of family or even living together is suspended, as their passive aggressive tendencies have created emotional walls between them. Fittingly, many shots filmed by cinematographer Deep Metkar support the notion of borders and distance. Overall, the state of disarray in the apartment mirrors the current condition of the characters themselves and, furthermore, whatever may be going on outside their home. The dirty clothes of each character, their injuries – the father’s bandaged hand, the mother’s facial burns – as well as their unkempt appearance seem to support the notion of violence and tension having distorted their lives. Finally, since the meal of the family is about to take place soon, this atmosphere will inevitably erupt, something which has been certain from the very first minutes of this skillfully crafted and performed film.